The CrossCore® 8-10 Person Multi-Purpose Rack is built using all heavy-duty commercial materials and can be placed in any location including residential, commercial, military and rehabilitation. In addition to the 8-10 CrossCore® users, this rack can accommodate functional attachments for circuit training including heavy bag, landmine and a dip station. 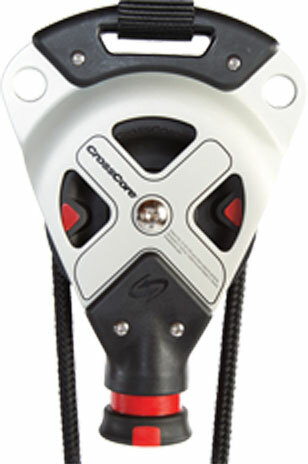 A simulated cable crossover can be created by using two CrossCore180® units and two counterweights such as kettlebells. 4 Double Connector Beams: 84 wide and 1.5 Round Steel Tubing. Connector Beams are welded to 3/8 steel plate bracket. Rack, Heavy Bag Holder, Landmine Attachment and Dip Attachment. Ships via one of our various freight carriers on a wooden pallet. This delivery is considered a curbside delivery only and will be delivered to a location at your address that is acceptable for a tractor trailer at the drivers discretion. Customers are required to be home at the time of delivery to sign the delivery receipt and help offload the individual packages from the tail end of the truck. On most deliveries, customers will receive a 24-hour notification before the delivery is made with lift gate.